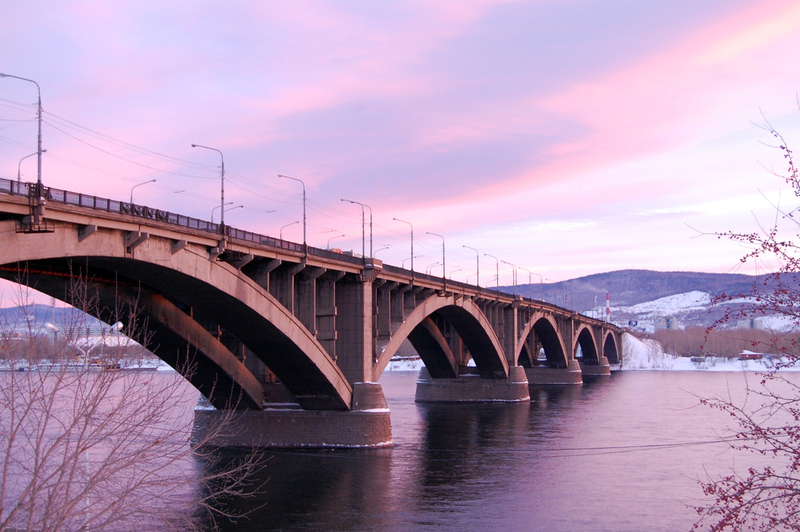 Communal Bridge over Yenisei in Krasnoyarsk. At the Krasnoyarsk Book Culture Fair (KRYAKK), which finished on Nov. 6, writers, publishers and visitors from all over the country debated the popular topic, “Modernity: A Dialogue with Tradition”. The venue, the Siberia Exhibition Center in Krasnoyarsk, some 2500 miles (4150 km) east of Moscow, was packed on Nov. 2, the opening day. The visitors were eager, mentioning publishing houses they remembered from last year and snapping up their stock of reading material for the year ahead. KRYAKK is organized by the Mikhail Prokhorov Fund, a private charity set up in 2004. Its goal is to support cultural projects in the Russian regions. KRYAKK-2016 was devoted to the question of how modernity and tradition interact. It offered an opportunity to consider how the past influences modern literature, and how the language of modernity derives its origins from the classics. The music and the theater sections of the book fair also investigated this topic. The theater program was curated by director Konstantin Bogomolov, who staged “Gargantua and Pantagruel” – based on Rabelais’ pentalogy of the same name – in conjunction with the Theater of Nations. “It is very scary and exciting because this production is highly complex and did not have a straightforward initial reception in Moscow,” the director admitted. His fears proved to be unfounded: the audience in Krasnoyarsk greeted the production with a standing ovation. The main program of the book fair offered numerous seminars with authors. The session with Guzel Yakhina, the author of the novel Zuleikha Opens Her Eyes, the main book of 2015, attracted so many visitors that the organizers had to urgently find extra chairs. “Krasnoyarsk features briefly in the novel and, judging by the audience’s reaction, many of them read it with their grandparents in mind,” the author said afterwards. “This was echoed by people who came to book signing. That means a great deal to me.” Yakhina’s novel is currently being translated into English and many European languages. KRYAKK also welcomes many foreign participants every year. This time, the fair was attended by writers, poets, and translators from the UK, Denmark, Sweden, Finland, and Switzerland. The guests included Russian literary translator Agnieszka Lubomira Piotrowska, Dr. Jo Turney, a fashion and design historian from the Winchester School of Art, Dr. Ben Hellman from Helsinki University, Movana Chen, an artist from Hong Kong, and Swiss author Franz Hohler.